This section contains the Guayubira Group information -available in English- related to the campaign against the spread of large scale monoculture tree plantations and against the installation of polluting pulp mills linked to those plantations. The social and environmental impacts of these megaproyects are widely denounced by the Group. Further information (in Spanish) is available in our web site. Nordic companies such as Metsa Botnia, UPM/Kymmene and Stora Enso are buying large areas of land in Uruguay and planting them with eucalyptus, as a first step for setting up pulp mills in the country. We believe it important to make the Finnish and Swedish public aware about the growing opposition in Uruguay to such investments. For that purpose, we aim to provide you with the opinion of different local actors and their reasons for opposing plantations and pulp mills, as well as their description of the impacts of such type of development. In this way, the Nordic public will be able to learn –in spite of the companies’ claims– that many people are opposing this move of the pulp industry to Uruguay. Mountains of Paper, Mounting Injustice – by the World Rainforest Movement – 2008. El Impacto de la forestación en Uruguay – (only in Spanish) by REDES / Friends of the Earth Uruguay – 2007. Historia de dos orillas – Un documental sobre las papeleras – (only in Spanish) by Emilio Cartoy Díaz. 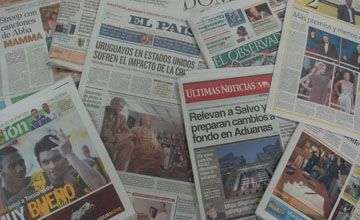 El Papel del Sur. Frente a la industria trasnacional – (only in Spanish) by Chayar / Grupo de comunicación cooperativa – 2006. Pulp Mills ¿A future for whom? – by Grupo Guayubira, on the installation of two pulp mills in Uruguay – 2004 / 2005. Stora Enso in Brazil – (English Subtitles) – by Kerstin Edquist, Magnólia Fagundes, Frida Svensson and Helena Soderqvist IN collaboration WITH MST, UBV, Biskops Arno Folkshogskola – 2006 / 2007. Greenwash: Critical analysis of FSC certification of industrial tree monocultures in Uruguay – by Ricardo Carrere. The aim of this report is to provide documented information and analysis to all those who are currently struggling against large-scale monoculture tree plantations and must face the additional problem posed by the fact that these same plantations are being certified by the FSC – March 2006. Pulp Mills: From monocultures to Industrial Pollution – by WRM, selection of articles published in the monthly electronic bulletin of the World Rainforest Movement – April 2005. Plantations are not forests – by WRM, selection of articles published in the monthly electronic bulletin of the World Rainforest Movement, addressing the issue of the impacts of large scale monoculture tree plantations – August 2003. The carbon shop: planting new problems – by Larry Lohmann, WRM, December 2000. Ten replies to ten lies – by Ricardo Carrere, WRM, August 1999. Pulpwood Plantations: a growing problem – by World Rainforest Movement, June 1999. Tree Plantations: Impacts and Struggles – by WRM, selection of articles published in the monthly electronic bulletin of the World Rainforest Movement on the issue of industrial tree plantations, February 1999. Pulping the South: industrial tree plantations and the world paper economy – by Ricardo Carrere & Larry Lohmann. 1996. World Rainforest Movement & Zed Books Ltd. 1996. National Initiative for the Suspension of monoculture tree plantations – since May 2007. The promotion of large-scale fast-growing monoculture tree plantations started in Uruguay in 1987, with forestry law Nº 15939 of December 1987. Today these plantations occupy over one million hectares of land and not only lands in the “forestry priority” category. Throughout these years, tree plantations has encroached grasslands and aquifer replenishment areas, surrounded grazing lands, left populations in isolation and made their effects felt. From the closing down of rural schools and drying up of neighbourhood wells, making any agricultural production impossible, to the concentration of land in the hands of foreign corporations attacking national sovereignty: four hundred thousand hectares of Uruguayan territory are in the hands of four transnational corporations: ENCE (Spanish), Botnia (Finnish), Stora Enso (Swedish-Finnish) and Weyerhaeuser (US). Opposition to this forestry model has also grown. Delegates from organizations of small farmers and other social organizations from various Departments in the country met on 14 and 15 April this year to discuss the problems generated by the advance of monoculture tree plantations. The meeting was very fruitful as it enabled the various movements and opinions being expressed in isolation to link together and address problems jointly, identifying the negative impacts of the plantations, and coming together to request the suspension of tree plantations. * negative impacts on the typical Uruguayan landscape. TO DEMAND the immediate suspension of all monoculture pine and eucalyptus plantations, with the exception of small-scale plantations for shelter, shade, firewood or inputs for the self-sufficiency of rural dwellers. “Guayubira” is the name of a rare and beautiful native tree of northern Uruguay, known for its elastic and incorruptible wood. The Group was established in May 1997 to highlight the value of and threats to native forests as well as to oppose the plantation of alien tree monocultures. It consists of a network of volunteers across Uruguay, including teachers, doctors, academics, students, social workers, environmentalists, foresters, Non Governmental Organizations and people affected by tree plantations. Today, only 3 per cent of the territory of Uruguay is covered by native forests, and even this small area is threatened. According to estimates, almost 25% of the country was under forest cover at the time when the Spaniards arrived in the country (Sixteenth Century). So-called “reforestation” (eucalyptus and pine tree monocultures) has resulted in some 800.000 planted during the past 18 years, resulting from government incentives (direct and indirect subsidies) to promote this activity. * generating awareness and supporting local groups opposing plantations and suffering from their impacts. As a result of the arrival of the pulp industry and its billion dollar projects at the turn of the century, the Group includes this new issue as a major component of its agenda because of its role in the consolidation and further expansion of monoculture pulpwood plantations. Guayubira is one of the founding members of the “National Initiative for the Suspension of monoculture tree plantations” launched in May 2007.